Also see places within Gravesend. Recorded as Gravesham in the Domesday Book of 1086 when it belonged to Odo, Earl of Kent and Bishop of Bayeux, the half-brother of William the Conqueror, its name probably derives from graaf-ham: the home of the reeve or bailiff of the lord of the manor. Another theory suggests that the name Gravesham may be a corruption of the words grafs-ham – a place "at the end of the grove". Frank Carr asserts that the name derives from the Saxon Gerevesend, the end of the authority of the Portreeve (originally Portgereve, chief town administrator). In the Netherlands, a place called 's-Gravenzande is found with its name translating into "Sand (or sandy area) belonging to the Count". The 's is a contraction of the old Dutch genitive article des, and translates into plain English as of the. In Brooklyn, New York, the neighbourhood of Gravesend is said by some to have been named for 's-Gravenzande. The Domesday spelling is its earliest known historical record; all other spellings – in the later (c. 1100) Domesday Monachorum and in Textus Roffensis the town is Gravesend and Gravesende, respectively. The variation Graveshend can be seen in a court record of 1422, where Edmund de Langeford was parson, and attributed to where the graves ended after the Black Death. The municipal title Gravesham was formally adopted in 1974 as the name for the new borough. At Fort Gardens is the New Tavern Fort, built during the 1780s and extensively rebuilt by Major-General Charles Gordon between 1865 and 1879: it is now Chantry Heritage Centre, partly open-air, under the care of Gravesend Local History Society. Journeys by road to Gravesend were historically quite hazardous, since the main London-Dover road crossed Blackheath, notorious for its highwaymen. Stagecoaches from London to Canterbury, Dover and Faversham used Gravesend as one of their "stages" as did those coming north from Tonbridge. In 1840 there were 17 coaches picking up and setting down passengers and changing horses each way per day. There were two coaching inns on what is now Old Road East: the Prince of Orange and the Lord Nelson. Post coaches had been plying the route for at least two centuries: Samuel Pepys records having stopped off at Gravesend in 1650 en route to the Royal Dockyards at Chatham. A permanent military presence was established in the town when Milton Barracks opened in 1862. Although a great deal of the town's economy continued to be connected with maritime trade, since the 19th century other major employers have been the cement and paper industries. From 1932 to 1956, an airport was located to the east of the town. It began as a civilian airfield, but during World War II it became a Royal Air Force fighter station, RAF Gravesend, and so Gravesend was heavily bombed by the Luftwaffe. In 1956 the site was taken over by Gravesend Town Council; a large housing estate known as Riverview Park was built on its site. At 03:35 GMT on Sunday 5 February 1939, Alex Henshaw took off from Gravesend Airport at the start of his record-breaking flight to Cape Town and back. He completed the flight in 39 hours 36 minutes over the next four days; his record still stands. Gravesend is part of and is the principal town of the Borough of Gravesham. The borough was formed on 1 April 1974, under the Local Government Act 1972, by the merger of the Municipal Borough of Gravesend and Northfleet Urban District along with several parishes from Strood Rural District. Gravesend was incorporated as a Municipal Borough in 1835 under the Municipal Corporations Act 1835 and Northfleet was constituted an Urban District in 1894 under the Local Government Act 1894: Gravesend absorbed Milton (1914), Denton, Chalk and part of Northfleet, including Claphall, Singlewell and King's Farm (1935). The location of Gravesend is at a point where the higher land – the lowest point of the dip slope of the North Downs – reaches the river bank. To the east are the low-lying Shorne Marshes; to the west, beyond Northfleet and the Swanscombe Marshes. The settlement thus established because it was a good landing place: it was also sheltered by the prominent height of what is now called Windmill Hill (see Landmarks below); although Windmill Hill still remains a dominant feature, Gravesend's highest point is actually further inland at Marling Cross, adjacent to the A2. From its origins as a landing place and shipping port, Gravesend gradually extended southwards and eastwards. Better-off people from London visited the town during the summer months; at first by boat, and then by railway. More extensive building began after World War I; this increased after World War II, when many of the housing estates in the locality were built. Part of the southern built-up area of the town was originally two separate rural parishes: viz, Cobham and Northfleet. Gravesend has an oceanic climate similar to much of southern England, being accorded Köppen Climate Classification-subtype of "Cfb" (Marine West Coast Climate). 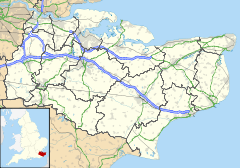 On 10 August 2003, Gravesend recorded one of the highest temperatures since records began in the United Kingdom, with a reading of 38.1 °C (100.6 °F), only beaten by Brogdale, near Faversham, 26 miles (42 km) to the ESE. The Brogdale weather station, which is run by a volunteer, only reports its data once a month; Gravesend, which has a Met Office site, reports its data each hour. Being inland and yet relatively close to continental Europe, Gravesend enjoys a somewhat more continental climate than the coastal areas of Kent, Essex and East Anglia and also compared to western parts of Britain. It is therefore less cloudy, drier, and less prone to Atlantic depressions with their associated wind and rain than western parts, as well as being hotter in summer and colder in winter. Since 1990 the economy of Gravesham has changed from one based on heavy industry to being service-based. The borough's estimated population in 2012 was 101,700: a 6,000 increase in less than a decade. It has a high population density (almost 10 people per hectare) compared to nationally; it has a relatively young population (40% of the population are below 30); and 60% of the population are of working age. Based upon figures from the 2001 Census, the second largest religious group in the Borough are Sikh, who at that time made up 6.7% of the population. However, if the term belief is used, Christians are most numerous at more than 70%, non-religious and undeclared are second and third, with Sikhs as the fourth group. The 2011 Census shows that, in the Medway area, Christians are now approximately 57% of the population, with the non-religious at 28%, whereas, in Gravesham, specifically, the population comprises 61% Christian, non-religious at 22% and Sikhs at 7.6%. Gravesend today is a commercial and commuter town, providing a local shopping district: there are several of the multiple stores, and a good range of local shops. It has a market hall, open six days a week, and a recently established farmers' market. Crew for Thames tugboats live in town, with Gravesend watermen often hailing from a family tradition. The Port of London Authority Control Centre (formerly known as "Thames Navigation Service") has its headquarters at Gravesend, providing maritime pilots with radar nowadays playing an important role in shipping navigation up the Thames. There is a variety of retail stores and shops in Gravesend. Gravesend market was first chartered in 1268. As of 2018, is situated in the heart of the town. Gravesend has the world's oldest surviving cast iron pier, built in 1834. It is a unique structure having the first known iron cylinders used in its construction. The pier was completely refurbished in 2004 and now features a bar and restaurant; with public access to the pier head when the premises are open. A recent £2 million investment in a pontoon is now in place at the pier head onto the Thames, which provides for small and medium-sized craft to land at Gravesend. On 17 September 2012, the Gravesend - Tilbury Ferry, relocated to the Town Pier, from its previous terminal in nearby West Street. Built in 1844 and originally named Terrace Pier, the prefix "Royal" was added in honour of Princess Alexandra of Denmark, who arrived at the Gravesend on her way to marry Edward, Prince of Wales (later King Edward VII) in 1865. River pilots have been based at this pier since the late 19th century. Today, Royal Terrace Pier is in constant 24-hour use, keeping vigilant as part of the Port of London Authority main operations centre; thus, its public access is available only occasionally during the year. This pier's initial construction was funded by the Gravesend Freehold Investment Company, at a cost of £9,000. It is 'T' shaped, with a pontoon at its pier head. Like the Town Pier, Royal Terrace Pier is also a Grade II listed structure. Situated at the top of Harmer Street, its foundation stone was laid on 6 September 1887. The memorial stone records that the clock tower was erected by public subscription (£700 was raised toward its construction) and dedicated to Queen Victoria, to commemorate the 50th year of her reign. Built of Portland and Dumfries stone and backed by London stock brick, the design of the structure is based on the design of the Elizabeth Tower in the Palace of Westminster, which houses Big Ben. The centre of the clock itself is measured at 50 feet (15 m) above ground and the face measures 5 ft 6 in (1.68 m) in diameter. An American sculptor, William Ordway Partridge, created a life-size statue of the 17th-century Native American princess Pocahontas, which was unveiled at Jamestown, Virginia in 1922. Queen Elizabeth II viewed this statue in 1957 and again on 4 May 2007, while visiting Jamestown on the 400th anniversary of foundation, it being the first successful English colonial settlement in America. On 5 October 1958, an exact replica of the statue by Partridge was dedicated as a memorial to the 17th-century Native American princess at St George's Parish Church. The Governor of Virginia presented the statue as a gift to the British people in 1958, a gesture prompted by The Queen's visit to the USA in the previous year. Windmill Hill, named after its former windmills, offers extensive views across the Thames and was a popular spot for Victorian visitors to the town because of the camera obscura installed at the Old Mill and for its tea gardens and other amusements. The hill was the site of a beacon in 1377, which was instituted by King Richard II, and still in use 200 years later at the time of the Spanish Armada, although the hill was then known as "Rouge Hill". A modern beacon was erected and lit in 1988, the 300th anniversary of the Armada. It was during the reign of Queen Elizabeth I that the first windmill was placed at the highest point in Gravesend, 179 ft (55 m) overlooking the high-water mark of the river. One mill burnt down in 1763 but was replaced the following year and that too demolished in 1894. The last surviving windmill is reported as having been destroyed by fire during Mafeking Night celebrations in 1900. During World War I an Imperial German Navy airship passed over Windmill Hill, dropping bombs on it; today there are three markers indicating where these bombs struck. The Thames has long been an important feature in Gravesend life and may well have been the deciding factor for the first settlement here. One of the town's first distinctions was in being given the sole right to transport passengers to and from London by water in the late 14th century. The "Tilt Boat" was a familiar sight on the Thames. The first steamboat plied its trade between Gravesend and London in the early 19th century, bringing with it a steadily increasing number of visitors to the Terrace Pier Gardens, Windmill Hill, Springhead Gardens and Rosherville Gardens. Gravesend soon became one of the first English resort towns and thrived from an early tourist trade. Gravesend "watermen" were often in a family trade; and the town is the headquarters of the Port of London Authority Control Centre (formerly known as Thames Navigation Service), supplying both river and sea pilots. Today radar plays an important role in the navigation of shipping on the River Thames. A dinghy at an unmodernised Gravesend was the backdrop to the 1952 thriller The Long Memory starring Sir John Mills. In the film, Mills plays a character living in poverty on a derelict fishing boat stranded in the mud flats. Gravesend also has one of England's oldest regattas retained from its strong maritime links with the Thames. Although the origins of the regatta are unknown it dates back at least to Tudor times. The races are traditionally competed by Gravesend Skiffs, 21-foot-long (6.4 m) oak-built clinker-built boats. St Andrew's Art Centre & Gallery, sits between Bawley bay and Anchor Cove, both being the embarkation point for British colonists sailing to New Zealand and Australia, in the early 19th century. The Thames Navigation Service was first thought up between 1950 and 1952 by Cdr Peter de Neumann GM RN, when he was captain of HMRC Vigilant (HM Customs & Excise) based at Gravesend Reach. [It is possible that "Vigilant Way" in Gravesend is named for her.] This idea followed on from considering such incidents as the accidental ramming of HMS Truculent by the Divina in 1950, the collision with the Nore Forts by Baalbek, and the disastrous flooding of Canvey, Foulness and the East Coast in 1953. In these and other situations, rescue and intelligence gathering were severely hampered by a lack of centralised command and control, and lack of detailed "picture". De Neumann resigned his command after returning Vigilant from the Spithead Review and joined the PLA, immediately suggesting in a report to them, submitted in 1953, that a feasibility study of such a system be commenced. He then oversaw its development and ultimate installation at Gravesend. Until the building of Tilbury Docks on the opposite side of the river, between 1882 and 1886, Gravesend was the Thames' first port of entry. Thousands of emigrants, as well as large numbers of troops, embarked from here. Tilbury Docks have expanded considerably since with the closure of all the London Docks. The entrance to the Docks is somewhat awkward, situated as it is on the sharp bend of the river, and often need tugboat assistance, as do the larger ships moored at Tilbury landing stages. There have been many tug companies based at Gravesend: among them the Sun Company, the Alexandra Towing Company and, today, the Smith Howard Towing Company. East Indiamen traditionally stopped here at a point known as Long Reach to lighten their loads before sailing up the Thames to moorings at Blackwall. For some years after war steamer excursions were run on the MV Royal Daffodil down the Thames from Gravesend to France, but they ceased in 1966. Cruises are now operated by the Lower Thames and Medway Passenger Boat Company up the river to Greenwich. The cross-river passenger ferry to Tilbury provides a long-established route to and from Essex. Before the Dartford Crossing came into being there was a vehicle ferry at Gravesend too. There is a RNLI lifeboat station based at Royal Terrace Pier which has become one of the busiest in the country. The Thames and Medway Canal was opened for barge traffic in 1824. It ran from Gravesend on the Thames to Frindsbury near Strood on the Medway. Although seven miles long it had only two locks, each 94 ft by 22 ft in size, one at each end. Its most notable feature was the tunnel near Strood which was 3,946 yds long, the second longest canal tunnel ever built in the UK. The great cost of the tunnel meant that the canal was not a commercial success. After only 20 years most of the canal was closed and the canal's tunnel was converted to railway use. Initially canal and railway shared the tunnel, with the single track built on timber supports, but by 1847 canal use was abandoned and a double track laid. Today Gravesend Canal Basin is used for the mooring of pleasure craft. Gravesend Sailing Club which was founded so that working men could participate in the sport while still having to earn a living is based here. The lock has been dredged and restoration and strengthening works have been carried out to the basin walls as part of regeneration of the area. The main roads through the town are the west-east A226 road from Dartford and beyond to Rochester; and the A227 road to Tonbridge. The A2 road passes two miles (3 km) south of Gravesend town centre; a mile stretch of it was rerouted in the early 2000s to take the traffic away from the south end of the town. In March 2006 the first of the area’s new Fastrack bus services, which use a combination of ordinary roads and dedicated 'bus tracks', opened. The service links to Ebbsfleet International railway station, Greenhithe, Bluewater Shopping Centre and Dartford. Gravesend railway station lies on the North Kent Line, and was opened in 1849. The Gravesend West Line, terminating by the river and for some time operating as a continental ferry connection, closed in 1968. Gravesend is the primary north Kent interchange for high speed and metro rail services. In December 2009, the full high-speed timetable between London and Kent came into force and passenger usage from Gravesend has exceeded expectations. High-speed services from London St Pancras International and Stratford International, are offered via Gravesend to the Medway towns, Sittingbourne, Faversham, Margate, Broadstairs and Ramsgate. Some of these services continue to Ashford International via Sandwich and Dover Priory. There are also metro services to London Charing Cross, London Waterloo East and London Bridge via Sidcup, via Woolwich Arsenal and Lewisham and Bexleyheath, and to Gillingham. Gravesend is served by several Arriva Kent Thameside bus services connecting the town with other areas in Kent including Dartford, Bluewater and Sevenoaks and to the Medway Towns. Gravesend is also served by Fastrack bus services connecting the town with Bluewater, Darent Valley Hospital and Dartford. Passenger ferry services to Tilbury, Essex, operate daily (except Sundays), from Gravesend Town Pier. The Saxon Shore Way, a long distance footpath, starts at Gravesend and traces the coast as in Roman times as far as Hastings, East Sussex; 163 miles (262 km) in total. The Wealdway also starts at the Town Pier, and continues almost due south over the Weald to Eastbourne in East Sussex where it links with South Downs Way, a distance of 80 miles (128 km). The town's principal Anglican place of worship is the Church of St George, Gravesend. This Georgian building is a tourist attraction because of its association with Princess Pocahontas, as well as being the parish church. Gravesend has three other Church of England parishes and Roman Catholic, Methodist, United Reformed and Baptist churches as well as other smaller chapels. Gravesend has a significant Sikh population. Its first gurdwara was founded in 1956 by Bhat Sikh Santokh Singh Takk (off Pelham Road South) in Edwin Street with a second one opening, ten years later, in a former Congregationalist church, but this gurdwara closed in 2010. The same year, one of the United Kingdom's largest and most impressive Sikh temples was opened at a cost of £12 million. In secondary education, Gravesend has the following schools: Gravesend Grammar School; Northfleet School for Girls; Northfleet Technology College (Northfleet School for Boys, on the former sites of Northfleet Secondary School for Boys and Gravesend Technical High School for Boys); Mayfield Grammar School (formerly Gravesend Grammar School for Girls); St John's Catholic Comprehensive School; Thamesview School and St George's Church of England School. There are also primary age schools such as Whitehill Primary School, special schools and several independent schools. Gravesend Hospital was opened in 1854, following the donation of a site by the 6th Earl of Darnley in 1853; it had its origin on 2 December 1850, as a dispensary on the Milton Road "to assist the really destitute poor of Gravesend and Milton and vicinities ... unable to pay for medical aid". By 1893, 4,699 such people had benefited by its presence. In 2004 the original building, and parts of the newer buildings were demolished to make way for a new community hospital. Gravesend Community Hospital provides a Minor Injury Unit, Dental services, Speech and Language therapy and Physiotherapy. It also has a Stroke Ward and offers inpatient care. The outpatient department provides care for much of the local area and is separate from those offered at Darent Valley Hospital. In addition, Gravesend emergency doctors out of hours service as well as podiatry are offered. In the town centre is a large medical clinic at Swan Yard, next to the Market car park, and several other doctors' surgeries are located in the area. The Stonebridge Road football ground at neighbouring Northfleet is home to Ebbsfleet United F.C., which changed its name from Gravesend and Northfleet F.C. in June 2007. Ebbsfleet currently plays in the Conference South, and the club won the FA Trophy in May 2008. An agreement was reached for the MyFootballClub online community to purchase a 75% stake in the club in November 2007, and its takeover was completed early in 2008. Gravesend Cricket Club is based at the Bat and Ball Ground on Wrotham Road, where cricket has been played since its foundation at the behest of the 6th Earl of Darnley (grandfather of the celebrated England cricketer, The Hon. Ivo Bligh, later 8th Earl of Darnley) in the mid 19th century. Gravesend also has two rugby teams, Gravesend RFC and Old Gravesendians, both situated next to each other opposite the Gravesend Grammar School. Established in the 1870s, Gravesend RFC have been the towns senior club since league rugby was established in the 1980s. In the 2009/10 season Gravesend RFC secured a league and cup double by winning the London 1 South title in emphatic style and the Kent Cup for just the second time. The 2010/11 season saw the club make their debut in National League 3 London & SE finishing a respectable 6th. This is the highest level attained, in their 130-year history, and only four leagues below The Aviva Premiership.They were also successful in retaining the Kent Cup, beating Tonbridge Juddians in a close fought final. Unfortunately, in the 2012/13 season, Gravesend were relegated from the National Leagues, but completed yet another league and cup double in 2013/14 beating Blackheath in the county final and promotion back to National League 3. The team also saw players in the victorious Kent team who won the County Plate at Twickenham. Old Gravesendians was traditionally the Old Boys Club for former Gravesend GS pupils. Old G's have had some of their best success in recent seasons reaching six Kent Plate Finals (winning two of these) and achieving promotion to London League rugby in 2009. Unfortunately this proved a step too far with relegation in 2009/10. Old G's put out three sides with the first team playing in Kent 1. The multi-sport facility at Gravesend Rugby Club, includes cricket, bowls, tennis, hockey, pigeon fanciers, table tennis, Wheelchair Rugby League, Wheelchair Rugby 7's and pétanque. The latter facilities with seventeen international size pistes are some of the best in the south of England, and can with a width reduction to 3 metres accommodate 48 teams. Rowing races have been held on the River Thames at Gravesend since at least 1698, with the first organised Regatta recorded in 1715. The first Borough Regatta began in 1882, setting the pattern for an annual event on the Thames that is carried on to this day. The River Thames in Gravesend is home to Gravesend Rowing Club, the oldest sports club in the town, the Regatta Committee's skiff rowers, and Gravesend Sailing Club. To the south of Gravesend on the ancient site of Watling Street on 43ha of land adjacent to the A2, Cyclopark, a venue for cycling events and other activities has been developed. The site which features mountain bike trails, a road circuit, a BMX racetrack and family cycling paths was formally opened in early 2012. The Gravesend Historical Society meets regularly and produces a biannual magazine on its activities. Charles Dickens lived at Gad's Hill Place, 2 miles (3.2 km) east of Gravesend and specifically mentions the town and its environs in at least three of his novels. In David Copperfield Mr. Peggotty, Ham and the Micawbers say their goodbyes and sail away from Gravesend to begin a new life in Australia. In Great Expectations, Pip, with accomplices, rows Magwitch from London downriver in expectation of waylaying a regular steamer (whilst under way in the Lower Hope, off Gravesend) bound for Hamburg. (Gravesend also appears in The Pickwick Papers). Gravesend is briefly mentioned in the 1818 novel Frankenstein by Mary Shelley during Victor's travels through the United Kingdom with Clerval; ultimately culminating in Victor's residence in the Orkney Islands. Also in the 1902 novel Heart of Darkness by Joseph Conrad the narrator has dark aired Gravesend as the perspective from which we continue our gaze of a sky that is mournfully gloomy over London. Waiting for the tide near the shores of Gravesend is the setting from which shipmate Marlow tells his tale. The War Game was a 1965 television drama-documentary film depicting a nuclear war. Written, directed, and produced by Peter Watkins for the BBC's The Wednesday Play anthology series, it caused dismay within the BBC and in government, and was withdrawn before the provisional screening date of Thursday 7 October 1965. The corporation said that "the effect of the film has been judged by the BBC to be too horrifying for the medium of broadcasting. It will, however, be shown to invited audiences..."
Despite this decision, it was publicly screened and shown abroad, winning the Academy Award for Best Documentary Feature in 1966. The film was eventually broadcast on 31 July 1985 on the BBC, during the week before the fortieth anniversary of the Hiroshima bombing, the day before a repeat screening of Threads. The film was shot in the Kent towns of Tonbridge, Gravesend, Chatham and Dover. The cast was almost entirely made up of non-actors, casting having taken place via a series of public meetings several months earlier. Much of the filming of the post-strike devastation was shot at the Grand Shaft Barracks, Dover. The narration was provided by Peter Graham with Michael Aspel reading the quotations from source material. The 1952 film "The Long Memory" starring John Mills was filmed in and around Gravesend. It features many squalid streets running down towards the river that even then were being progressively cleared for redevelopment. It is also possible to hear in the background steam engines working out of the Gravesend West Line West Street terminus. Except for the skeletal remains of the pier all evidence of this station has now disappeared. Pocahontas (1595–1617), the daughter of a Native American chieftain, was to become the first such American to visit England. After marrying an English colonist in America, John Rolfe, she later sailed with him to London, with their two-year-old son, Thomas, where she was received at Court being feted as a celebrity in London. On their return voyage, seven months later, she was taken ill and died ashore in Gravesend at age 21. She was then buried under the chancel of St George's parish church. Charles Dickens is associated with Gravesend and villages around the borough. Although he died over 100 years ago, many of the links between him and Gravesham are still in evidence – Gravesend he visited, at Chalk he spent his honeymoon, at Higham he lived and died, and at Cobham he found inspiration for The Pickwick Papers. Gravesend is associated with Major-General Charles Gordon (1833–1885), who lived in the town during the construction of the Thames forts. For six years he devoted himself to the welfare of the town's "poor boys", establishing a Sunday School and providing food and clothes for them from his Army wages. As commanding officer of the Royal Engineers from 1865 to 1871, he was in charge of the forts guarding the Thames downstream from Gravesend, New Tavern Fort in the town, Shornemead Fort on the Thames's south bank, and Coalhouse Fort on the north in Essex. 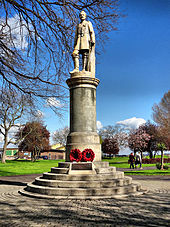 His links with Gravesend are commemorated locally on the embankment at the Riverside Leisure Area, which is known as the Gordon Promenade, and at Khartoum Place that lies just to the south. General Gordon's tomb lies in the crypt of St Paul's Cathedral. The composer Nikolai Rimsky-Korsakov (1844–1908) was an officer in the Russian Navy and was posted to Gravesend in 1862, where he wrote part of his first symphony, said to be the first such style of composition attempted by a Russian composer. Sir Edwin Arnold (1832–1904), English poet and journalist whose most prominent work as a poet was The Light of Asia (1879). Gemma Arterton (born 1986), actress, was born at Northfleet and attended Gravesend Grammar School for Girls. Harry Reid (actor) (born 1992), actor whose most prominent work as an actor is currently in EastEnders as Ben Mitchell, was born in and lives in Gravesend. Attended Northfleet Technology College (formerly known as Northfleet School for Boys). Trained in acting, physical theatre and musical theatre at Miskin Theatre in Dartford, Kent from 2008 until 2010. Sir Derek Barton (1918–1998), English chemist and Nobel Prize winner for "contributions to the development of the concept of conformation and its application in chemistry". Admiral Sir Francis Beaufort (1774-1857), creator of the Beaufort Scale, was stationed at Gravesend. Sir Peter Blake (born 1932), artist who trained at Gravesend School of Art. The Blake Gallery has recently been opened at the Woodville Halls in the town. Thom Gunn (1929–2004), Anglo-American poet, was born in Gravesend. His most famous collection, The Man With Night Sweats (1992), is dominated by AIDS-related elegies. He relocated to San Francisco, California in 1954 to teach writing at Stanford University and remain close to Mike his partner whom he met whilst at university. Katharine Hamnett (born 1947), celebrated fashion designer. Adam Holloway (born 1965), local Member of Parliament since 2005, lives on Darnley Road in the town. John MacGregor (1825–1892), English writer, who designed the "Rob Roy" canoe. David Rutley (born 1961 at Gravesend), first Mormon UK Member of Parliament. Charles Stewart, 3rd Duke of Richmond, resided at Cobham Hall, 5 miles (8 km) south east of Gravesend, until 1672 (followed by his descendants, the Earls of Darnley). ^ Paul Theroux's report that "the town bore the name of Gravesend because east of it, the dead had to be buried at sea", is unsupported (Theroux, The Kingdom by the Sea 1983:19). ^ "Gravesend, Brooklyn - Forgotten New York". ^ "History of Gravesend, in Gravesham and Kent | Map and description". Visionofbritain.org.uk. Retrieved 27 February 2016. ^ "AALT Page". Aalt.law.uh.edu. Retrieved 27 February 2016. ^ Hiscock, Robert H (1976). 'A History of Gravesend. London: Phillimore & Co Ltd.
^ "The Chantry". Gravesham Borough Council. Retrieved 27 March 2017. ^ "Milton Chantry". English Heritage. Retrieved 27 February 2016. ^ "The Woodville Halls, Gravesend | Whats On and Show Information for the latest shows". Theatresonline.com. Retrieved 27 February 2016. ^ "myADS". Archaeology Data Service. Retrieved 27 February 2016. ^ "Layston Church". Layston Church. Retrieved 27 February 2016. ^ Price, Love and Hate. p. 182. ^ "Entry in the Gravesend St. George composite parish register recording the burial of Princess Pocahontas on 21 March 1616/1617". Medway: City Ark Document Gallery. Medway Council. Retrieved 17 September 2009. ^ "Pocahontas". St. George's, Gravesend. Retrieved 31 May 2012. ^ Gordon Gardens. "Gordon Gardens | Garden | Gravesend|Kent". Gogravesham.co.uk. Retrieved 27 February 2016. ^ "New Tavern Fort". Visitkent.co.uk. Retrieved 27 February 2016. ^ "The New Tavern Fort". Archived from the original on 5 February 2012. Retrieved 28 January 2012. ^ "Public Houses, Inns & Taverns of Gravesend, Kent - A listing of historical public houses, Taverns, Inns, Beer Houses and Hotels in Gravesend, Kent". Pubshistory.com. 17 May 2015. Retrieved 27 February 2016. ^ "Samuel Pepys". History Learning Site. Retrieved 27 February 2016. ^ "Milton Barracks". Pastscape. 8 March 2016. Archived from the original on 9 March 2016. ^ "Kent Today & Yesterday: Demolition of Blue Circle / Lafarge Cement Works Northfleet". Kenttodayandyesterday.blogspot.co.uk. 27 March 2010. Retrieved 27 February 2016. ^ "Gravesend Past and Present". About-gravesend.co.uk. 5 May 2009. Retrieved 27 February 2016. ^ "Home - Gravesham Borough Council". Gravesham.gov.uk. Retrieved 27 February 2016. ^ "Library details". Webapps.kent.gov.uk. Retrieved 27 February 2016. ^ "Gravesend, England Köppen Climate Classification". Weatherbase.com. Retrieved 27 February 2016. ^ "BBC – On This Day | 10 | 2003: Britain swelters in record heat". BBC News. 10 August 2001. Retrieved 27 February 2016. ^ "Climate summaries". Met Office. 3 February 2016. Retrieved 27 February 2016. ^ "Temperature Record - 10 August 2003" (PDF). Met Office. Archived from the original (PDF) on 3 March 2016. Retrieved 27 April 2015. ^ "Gravesend weather forecast". Met Office. 1 May 2014. Retrieved 27 February 2016. ^ "Flash flood warnings for parts of England". BBC News. 27 June 2011. ^ "Latest news from around Great Britain - MSN News UK". News.uk.msn.com. 16 February 2015. Retrieved 27 February 2016. ^ "Weekend hot weather saw Brits flocking to the beaches | Metro News". Metro.co.uk. 11 July 2010. Retrieved 27 February 2016. ^ "Gravesham Borough: Key Statistics Report 2007" (PDF). Archived from the original (PDF) on 9 June 2011. Retrieved 8 May 2008. ^ "Contact Us". Pla.co.uk. Retrieved 27 February 2016. ^ "Gravesend Borough Market to celebrate 750th anniversary of being chartered". Retrieved 22 May 2018. ^ "Gravesend Town Pier". Archived from the original on 14 November 2012. Retrieved 26 December 2014. ^ "Riva Waterside Restaurant & Bar | Town Pier, West Street, Gravesend, DA11 0BJ | Tel 01474 364694". Rivaonthepier.com. Retrieved 27 February 2016. ^ "Gravesend Town Pier - National Piers Society". Piers.org.uk. Archived from the original on 5 March 2016. Retrieved 27 February 2016. ^ "Collage". Archived from the original on 1 June 2015. Retrieved 17 December 2014. ^ The Dedicated Partnership - promoting tourism - http://www.dedicate.co.uk. "Gravesend Clock Tower in Gravesend". UK Attraction. Retrieved 27 February 2016. ^ Reserved, Gravesham Borough Council - All Rights (1 January 2016). "US Ambassador visits Gravesend". ^ "Port of London Authority". Pla.co.uk. Retrieved 27 February 2016. ^ The East India Docks: Historical development', Survey of London: volumes 43 and 44: Poplar, Blackwall and Isle of Dogs. 1994. Retrieved 7 November 2007. ^ "The RNLI is the charity that saves lives at sea". Rnli.org. 29 January 2016. Archived from the original on 25 February 2016. Retrieved 27 February 2016. ^ "The A2 Trunk Road (Pepperhill to Cobham and Slip Roads) Order 2005". Opsi.gov.uk. 4 July 2011. Retrieved 27 February 2016. ^ "Guru Nanak Darbar Gurdwara". Gurunanakdarbar.org. Retrieved 27 February 2016. ^ "Dartford and Gravesend Schools | Find a School in Dartford and Gravesend". Locallife.co.uk. Retrieved 27 February 2016. ^ "Kent Community Health NHS Foundation Trust - Gravesham Community Hospital". Kentcht.nhs.uk. Retrieved 27 February 2016. ^ "Fans website approve Fleet deal". BBC Sport. 23 January 2008. Retrieved 23 January 2008. ^ "Gravesend Cricket club". Archived from the original on 17 December 2014. Retrieved 17 December 2014. ^ Gravesend RFC (29 November 2012). "Gravesend RFC". Gravesend RFC. Retrieved 27 February 2016. ^ "Welcome to Gravesend Regatta Committee". Gravesend-regatta.co.uk. Retrieved 27 February 2016. ^ "Gravesend RC". Gravesend RC. 9 September 2016. Retrieved 9 September 2016. ^ "Cyclopark". Cyclopark. Retrieved 27 February 2016. ^ James Costley-White (21 December 2010). "Big new cycling centre for Kent". BikeRadar. Retrieved 27 February 2016. ^ "Gravesend Historical Society". Ghs.org.uk. Retrieved 27 February 2016. ^ "Gordon's Tomb, St Paul's Cathedral | Renouard, Charles Paul | V&A Search the Collections". Collections.vam.ac.uk. 14 January 2016. Retrieved 27 February 2016. ^ "Edwin Arnold, famous people from Gravesend". Information-britain.co.uk. 12 February 2007. Retrieved 27 February 2016. ^ "The Blake Gallery". Archived from the original on 17 December 2014. Retrieved 17 December 2014. ^ "Carl Ekman". Discover Gravesham. Gravesham Bourough Council. Retrieved 5 March 2016. Wikimedia Commons has media related to Gravesend. Wikivoyage has a travel guide for Gravesend. A nice picture of frigate off Gravesend 1600s? I'm afraid that the picture is roughly a hundred years too late. If you go the the small-image page (there's a link above the image) you get the info about the painting, and this one is tentatively dated to the 1750s. The style of the larger ship's stern is certainly not of the diary period. Neither is the artist. The Ship & Lobster, Gravesend, is the first and last pub on the Thames. This pub was supposedly founded when Charles II and his brother James raced barges here. Pocahontas, one of the first Native Americans to visit Europe, landed at Gravesend when illness forced her to abandon her return journey to America on March 21, 1617. Pocahontas died just a few hours after coming ashore. Only 21, she experienced much in her short life and left a young son, Thomas Rolfe. He was taken back to London and completed her aborted journey home in adulthood, while his mother was buried at St. George’s church, where today a handsome bronze figure embodies her presence.